You might assume that the huge inflow of asylum-seekers since 2015 has made Europe more xenophobic. Opinion polls tell a more nuanced story. In November 2014 Eurobarometer began asking citizens of EU countries about their sentiments towards immigrants. Since then, the overall share of people who have negative feelings about arrivals from outside the bloc has fallen from 57 % to 52 %. Different regions, however, have been pulling in opposite directions. Western and southern European countries have generally become friendlier to foreigners, while northern and eastern countries have grown more hostile. 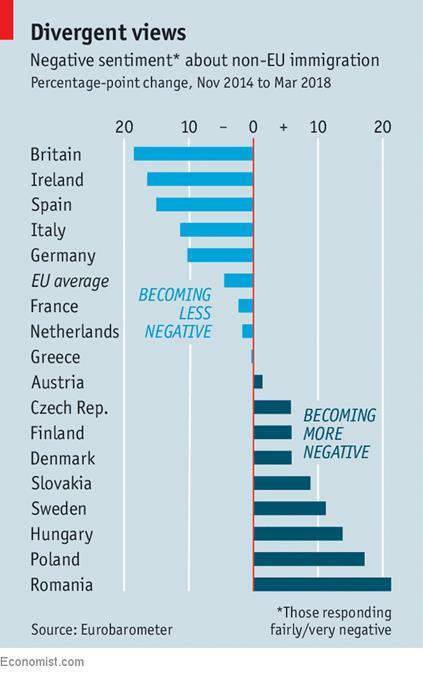 Crucially, though, there seems to be no correlation between how many migrants and refugees a country admitted and its changing opinions of non-Europeans. To be directed to the article, please click here.